It’s been such a mild winter here that we were back in the field on Tuesday to finish uncovering the dairy floor at the Durant-Kenrick House in Newton. Here’s a picture of the complete floor. The dairy is in the path of new construction, and Historic Newton considered a number of different option to save it. In the end, none of the modifications to their construction plans were feasible, so they have decided to save all of the pieces of the building to potentially re-assemble elsewhere on the site so that the building can be interpreted. We screened the rest of the fill and recovered a number of interesting small artifacts, including the top to what is probably a mid-19th century canned fruit jar printed in German. 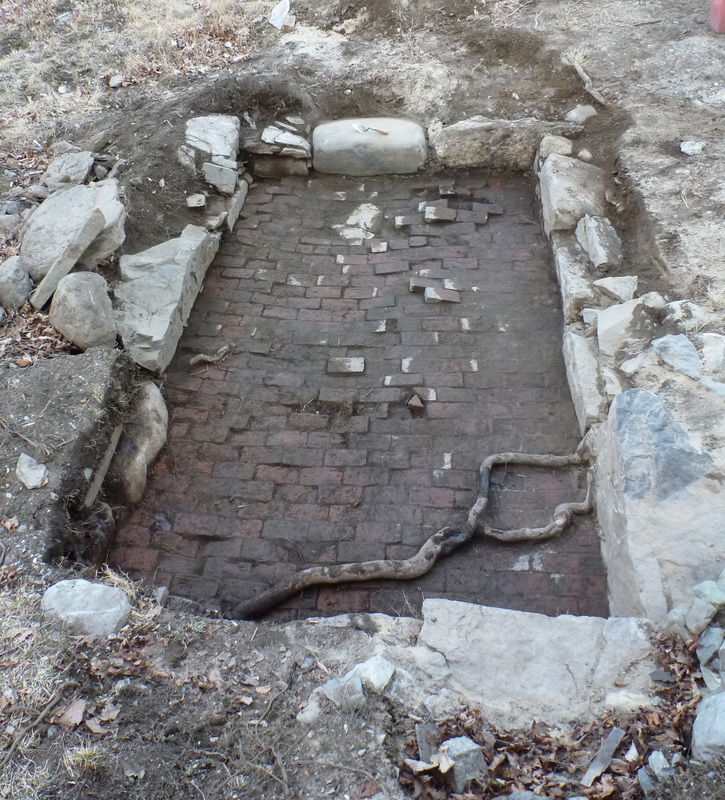 Since our last post, we uncovered much more of the small, brick floored outbuilding at the Durant-Kenrick house and have tentatively identified it as a dairy where milk would be set out in broad shallow pans to cool and allow the cream to separate. It dates to the Kenrick occupation of the house. 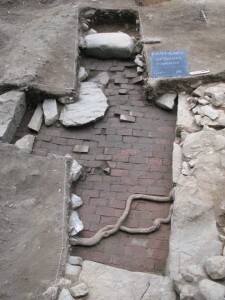 The brick floored area is about 6 by 10 feet, and may have been part of a slightly larger complex, in a very similar location to the ell that was just demolished. This size is typical for a dairy. The brick floor allows the space to be kept clean, and the fact that it is below grade means that it would be cool; both of these are features that help us to determine its function. In this photo, several students are cleaning off the floor so that we can take final photos of it. Although we haven’t uncovered the whole interior, we can see enough to learn it dimensions, to study its construction, and to speculate about its function. And here it is! The photo is taken from near the back corner of the house; the house and the bricked area meet corner to corner at the lower right of the photo. You can see a long section of the wall along the right, and sections of the wall at the top, left, and bottom, though three of the corners are still buried. One unit opened up during week three at Newton revealed at brick surface beneath layers of soil and destruction rubble, including cobbles, broken bricks, and mortar. The 1 x 2 meter unit was placed in an area of the backyard so that the southern (bottom) half of the unit was underneath the recently-demolished ell, while the northern (top) half of the unit was outside the ell. 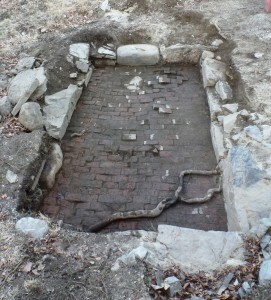 The brick surface may have been the floor of an older ell, and the large rock at the northern end of the unit is thought to be a remnant of the foundation. Currently, the unit is being expanded to the south in order to find the edge of the brick floor. Units will eventually be opened to the east and west as well, to determine the dimensions of the floor. Among the contenders for the “artifact of the week” award are these fragments of a large plate with a multi-colored, hand painted decoration on a tin glaze. These pieces came from a trash layer about a foot below the modern surface. While we are not absolutely certain of their origin, the color of the ceramic paste and the range of colors used in the decoration suggest that they might be from France. 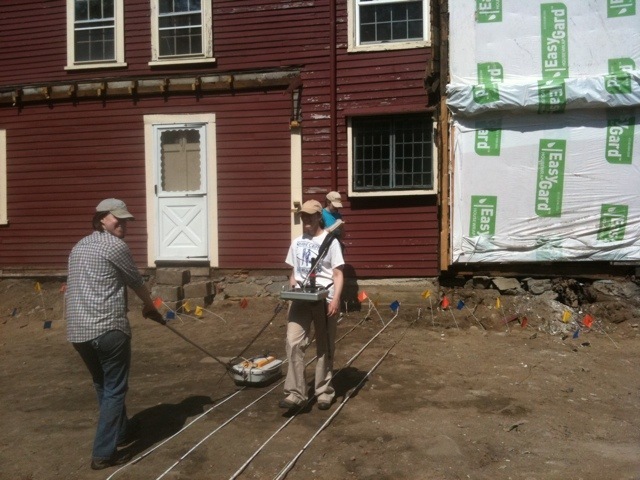 Week two at Newton was spent excavating ten shovel test pits along the south (right) and west (front) facades of the house. Shovel test pits (STPs) are 50 x 50 centimeter square holes oriented on a grid system that give us an idea of the kinds of activities that occurred during the life history of the site. We collect artifacts from different soil layers that vary according to color, texture, and composition. 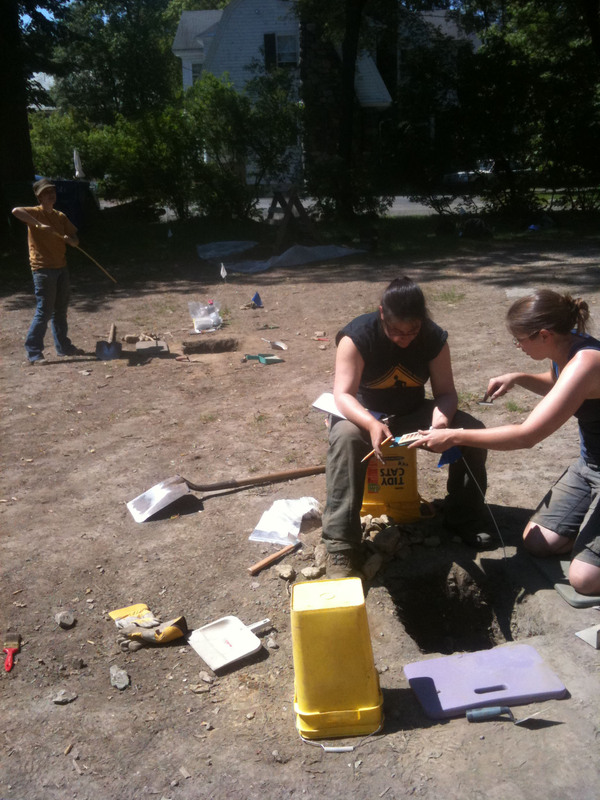 Artifacts, combined with irregularities in the stratigraphy, help us pinpoint date ranges for house-related activities and give us an idea of what to look for in other areas of the site. Along the side of the house, STPs revealed an area of built up rubble next to the foundation containing mostly large cobbles and brick. 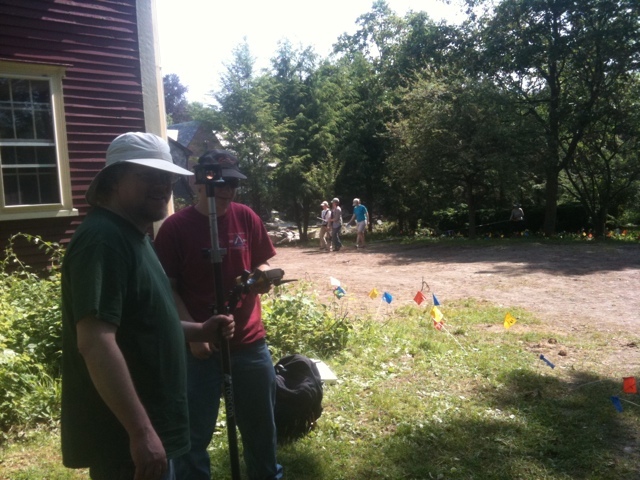 Two STPs had a buried ground surface about 35 centimeters (1 foot) below the current ground level. An STP at the southwest corner of the house uncovered a decorated rim sherd from a white salt-glazed stoneware plate. This ceramic type, as well as the distinctive “Dot, Diaper, and Basketweave” decoration, was popular during the mid-eighteenth century, giving us a clearly defined date range for the deposit in which it was found. 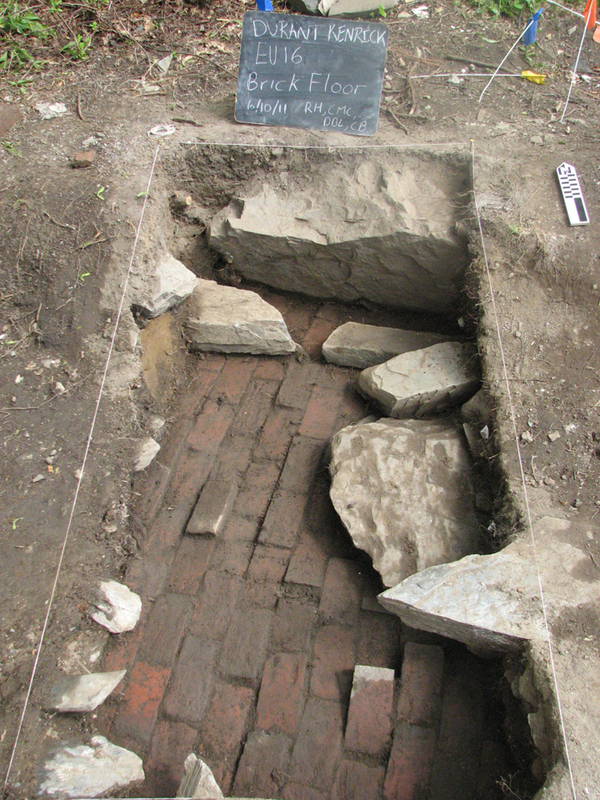 Along the driveway, STP 5 unearthed a cobbled surface that may be a part of an older paved surface. 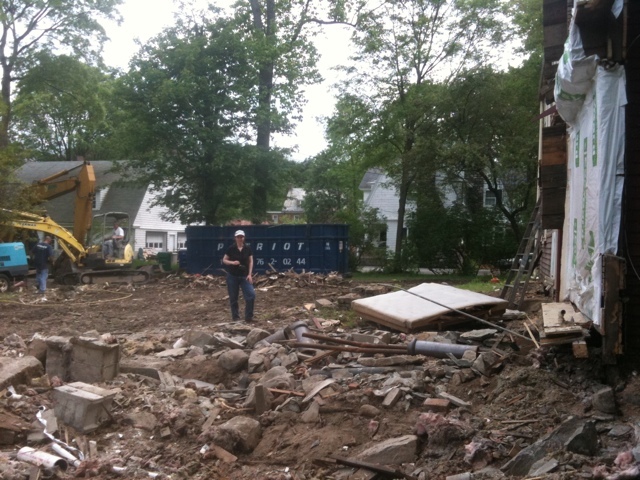 Several STPs along the front of the house had a layer of dense stone rubble, most likely deposited during the construction of the foundation. 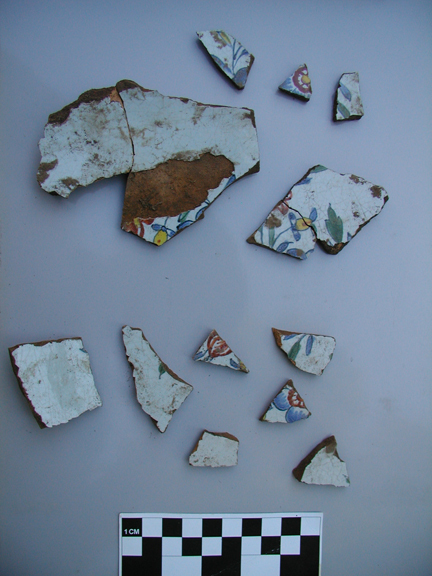 Some notable artifacts found included creamware, hand painted pearlware, Westerwald stoneware, Staffordshire slipware, Imari style Porcelain, pipe stems, and several buttons. This week we’ve done some STPs and larger units behind the house, more information on those coming soon! John & Ryan take point to set out the grid. 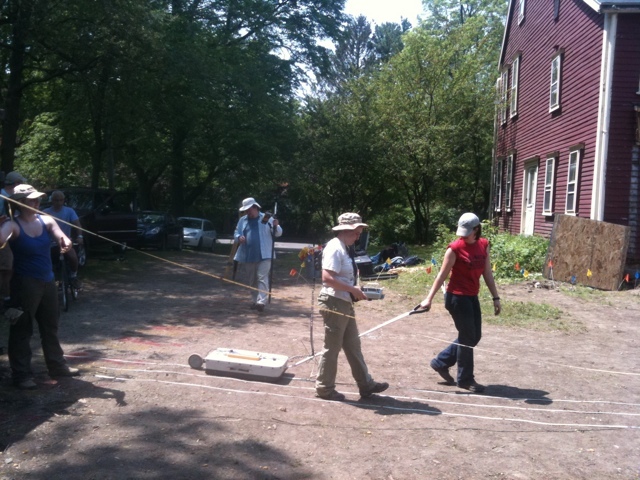 Using the Malå 250 MHz ground penetrating radar (GPR) Chris, Kat, Sam, & Danielle are surveying the back yard. 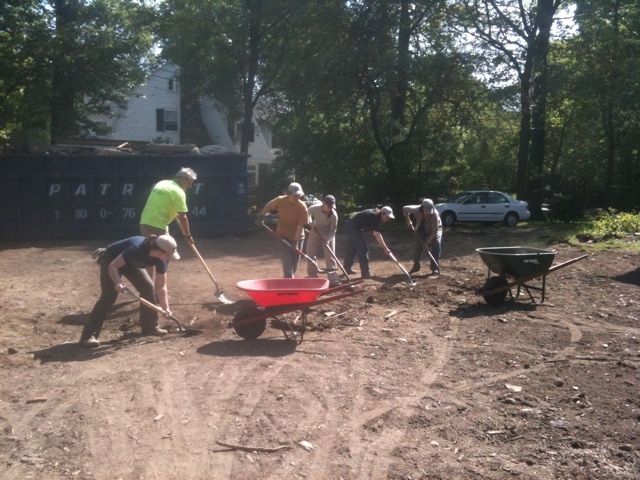 The crew begins excavation by shovel scraping. This will give us the very smooth surface that we need to do geophysics to detect buried structures or other archaeological features.